Outdoor Nativity Store Holy Family Outdoor Nativity Set (Standard, White) by Outdoor Nativity Store at Two Clock. MPN: 21-0200-1. Hurry! Limited time offer. Offer valid only while supplies last. Simple and striking. The Outdoor Nativity Set Series proclaims the meaning Christmas with elegance in your yard or garden - in any winter climate. Simple and striking. The Outdoor Nativity Set Series proclaims the meaning Christmas with elegance in your yard or garden - in any winter climate. 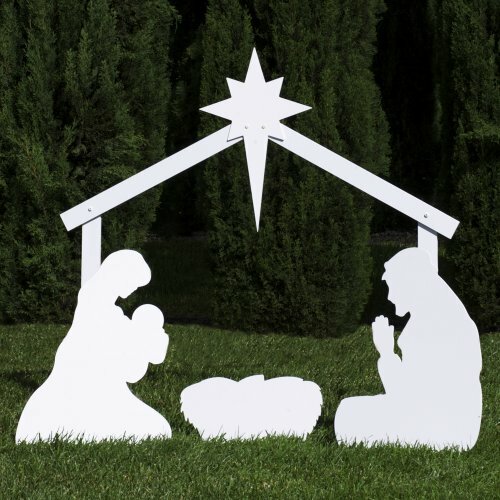 The Outdoor Nativity Set Series is made of all-weather, fade-resistant PVC plastic (figures are 1/4" thick; stable is 3/8" thick). All-weather, fade-resistant PVC plastic. Made in USA. If you have any questions about this product by Outdoor Nativity Store, contact us by completing and submitting the form below. If you are looking for a specif part number, please include it with your message.